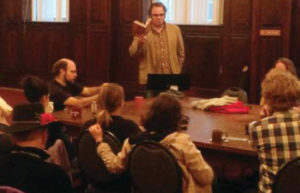 One of our efforts as we minister to the Art world is to also be a voice in and from the Church. If the Church grew in its ability to inspire artistic imaginations it would go a long way toward positively impacting this world. One of the ways we do this is spending time investing in a local church, Hill City Church (a church plant of the Associate Reformed Presbyterian Church). This Fall, Kirk has been speaking during the evening services on the topic of “evangelism”, taking content from Questioning Evangelism by author Randy Newman. Mr. Newman did a study of the Gospels on each of the instances where Jesus was asked a question. A majority of the time, Jesus responded in kind—a question with a question. Newman wrote the book in response to this study. A posture of responding similarly is something that appeals to artists. We have tried to cultivate this in our own lives and believe it is needed in the way the Church engages the Arts and the world. Most of the talks have been recorded and when they are posted we will let you know where you can listen to them on our website. It seems Sarah has been immersed in playing cards, this past year. No, not the type you use in Vegas, but ones designed to be used for relational engagement and personal development. Cards seem to be an efficient tool to use as they are small, easy to pack, and adaptable. She’s illustrated and designed additional cards and edits for the Perspective Cards—which engage people’s worldview. She has re-branded and re-designed the Soularium cards—which engage people over significant issues related to their lives, and this past spring and summer she designed a new deck called The Connect Cards. Without great intentionality from the leader, small groups can easily digress into merely a hangout time for Christians without a sense of direction. 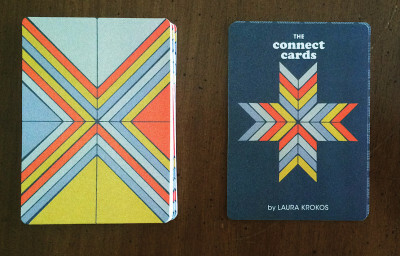 Laura Krokos—writer of the blog MissionalWomen.com—wrote the content for The Connect Cards with this in mind. “For me, The Connect Cards were an easy way to incorporate training, prayer and community into my small group Bible study. They…provide a way to take your small group to the next level without hours of extra preparation!” —Jesse Denison, Director of Master Plan Ministries, Denver Most of the tools Sarah has designed are available at the Cru webstore: www.crustore.org. The Connect Cards will be available soon! Our Plein Air event went well—11 people came out to experience the hospitality of the Olson’s farm and create art together—one more touch point of relationship with some of them. Kirk’s kidney check up showed no change—for good or ill.